There is no charge to join, your credit card will be billed when the wine is shipped, and you can quit at any time after having accepted at least two shipments. Members receive wines available only through the winery, rare and library wines, as well as our regular releases. Many of our club members who live in the area opt to pick up their wines at the Margerum Tasting Room (or the Winery) and attend our fun quarterly Pick Up Parties. Automatic quarterly shipments of three different wines discounted by 15%. A 10% discount on all purchases, 15% discount on case purchases, and 20% discount on three or more cases. Discounted, or free, admission to our Open Houses and Margerum Wine Company events. Pre-release announcement and availability of small-lot wines. 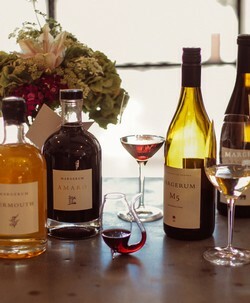 Complimentary tasting for member and a guest at our Santa Barbara or Buellton tasting rooms. Wine club members can add on extra bottles of wine to their wine club shipments at no extra shipping cost than their regular shipment. Enjoy an additional 10% savings on all wine club reorders within 30 days of wine club shipment. Specials on select wines sent via email only to wine club members. Free wine club pick up parties. You can access NOTES for all Wine Clubs online HERE.